What started in 1998 as a small club amongst friends who love modifying and racing their German cars, has now grown into the largest private club for discerning collectors and enthusiasts of classic European cars & motorcycles. Fuelfed focuses on driving, socializing and promoting the passion of unique European automotive ownership. It has always been about WHY WE DRIVE, NOT JUST WHAT. 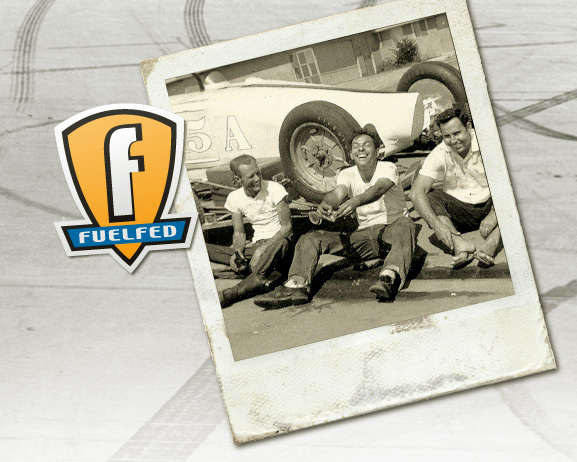 In 2010, Fuelfed became the originator of monthly Sunday morning Coffee & Classics®gatherings with its first location in Winnetka, Illinois. Fuelfed Coffee & Classics® gatherings are now held in Winnetka, Barrington, Hinsdale as well as in Thiensville, Wisconsin, and Fort Lauderdale, Florida. These events set the national benchmark for enthusiast camaraderie and top collector car variety. Our club members enjoy our highly specialized road tours and rallies like our TFD series, W3, Fuelfed Fall Classic and MotorGearo 250. Fuelfed also believes in supporting small local businesses with our original Spontaneous Combustion® evening gatherings as well as showcase garage tours. Fuelfed was founded on the spirit of driving and mechanical connectivity and has built itself with members who believe this same ethos. Learn more about Fuelfed does in our membership section. Hey! My Sis’, Angela Shaffer, turned me onto your site! Good stuff!! You have good taste! Rocking blog you guys have going here! I’m definitely going to be checking back. Found you through Freshly Pressed — congrats on that too! I just discovered your blog and I´m having a LOT of fun reading your Posts! Stumbled onto Fuelfed through the Coffee & Classics poster now found in establishments all around the Northshore. Love the philosophy of an irreverent, fun, car culture group. Cars are fun…………….lets have serious fun with them………..
and NOT be so Serious!!!! Why does this type of group exist in California in so many places and not here in Chicagoland? Is the Fuelfed philosophy the answer to our prayers? We can only hope so………. We have found another brother! This is a really great car blog. You’re Fuelfed blog has evolved into a soulful vision far more interesting than most of the rehash car cramp that’s out there. Actually I arrived here from a Nürburgring forum on an unrelated topic. Worth surfing sometimes. Thanks. Attended my first C&C today. You folks have some magic in a bottle here. Very nice, low key, and super people.